Today I was lucky enough to get an interview with Gav Thorpe, Black Library and Design Studio veteran, and author of one of the newest AoS novels, Warbeast. We go over his thoughts on a few of the key moments and characters from the novel, as well as the moment he found out about AoS for the first time. Warning, if you haven't read Warbeast yet there are spoilers in this interview! Tyler: I guess first things first, when did you first hear about the plans for Age of Sigmar and what was your first reaction? Gav: The first inkling of the changes came from the meetings we had around The End Times. The Black Library and GW folks pointedly didn’t discuss what happened afterwards but it was very clear it was going to be a big shift. Knowing that the End Times were going to finish they way they did (y’know, the END) gave some clue that the Old World would not be as it was. After that there were a few conversations and little bits with people I know at GW but everyone was tight-lipped as you can understand. The reveal for me came when I was brought in by GW and BL for a briefing (along with David Guymer, though others had seen it earlier) and the whole show was laid out, with art, books, Stormcast models and everything else. It was too much to think about on the spot, and even now it’s hard to get my head around a whole new setting. I’ve only dabbled at the edges of the background and narrative really. Tyler: Warbeast is one of the few AoS books out so far which doesn’t follow along with a campaign book’s storyline. Did you enjoy that freedom as opposed to having to follow a preset story? Gav: It was essential for me – I don’t think I could have written a book that was as tightly briefed and connected as many of the earlier novels, that just wouldn’t work. It was enough of a challenge to do Curse of Khaine for the End Times and tie it to the existing storyline, doing so with a whole new set of characters and narrative would have been very difficult. Tyler: What made you pick the Celestial Vindicators and Knights Excelsior as the two Stormhosts in the book? Gav: I had two characters in mind and fixed ideas of their personalities, so it was a matter of finding two Stormhosts that would fit. The dominant characteristics of the Stormhosts were still being developed at the time, but the Celestial Vindicators quickly emerged as the obvious choice for the Warbeasts, while there were several that could have been right for the Silverhands so I opted for one of the Stormhosts that weren’t being used by another author. With that decision made it shaped Theuderic Silverhand a little bit more. 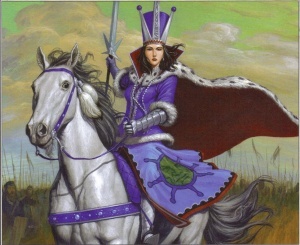 Tyler: There are a few nods to the Old World in Warbeast, the most exciting for me being whom I take to be the Ice Queen of Kislev. What was your thought process on including these parts and was this something you had to run by GW first to make sure it didn’t contradict anything planned? Gav: One of the main back-and-forth issues when I submitted my initial synopsis was how much of the World-That-Was I should include and how overtly. I think it’s great that there are these fragments of the past scattered through the Realms, tiny fossils of the Old World and beyond. Black Library, rightly, wanted to make sure the story was about the Stormcast and Age of Sigmar, so I tried to get the balance right – never outright saying what anything was but giving veteran readers little Easter eggs to find. The important part was to layer on the ages between the World-That-Was and the current timeline. 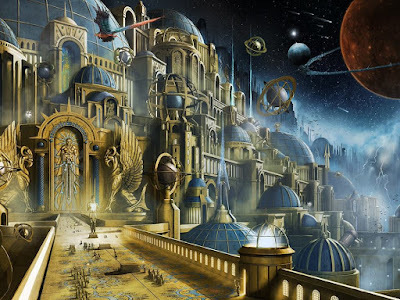 These were not remnants from a few years past, but millennia-old civilisations that have risen and fallen, where certain metaphysical and mythical constants have remained in spirit. Tyler: The realms of AoS are clearly born out of the death of the World-that-Was, how linked do you find these two settings to be, or do you think AoS should strive to move away from its roots a bit more to become its own thing? 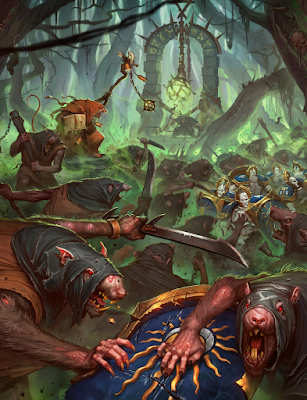 Gav: Age of Sigmar has to be its own thing, and ‘work’ on its own terms. Little nods and references as I’ve done in Warbeast are fine. They’re in-jokes almost, between the creators and fans. What they can’t be is an attempt to write old Warhammer by the back door. 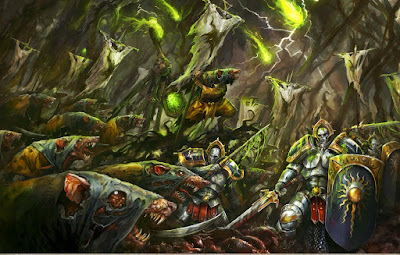 I think fans should be able to imagine the roots of AoS in the Warhammer World and feel that the new setting comes from the same wellspring, but there doesn’t have to be an obvious, literal link to everything that came before. Tyler: How difficult is it for you to come up with all of the unique “Warhammery” names in your books? Gav: With Warbeast I was given a little bit of guidance on Stormcast-y type names, with most of mine being real or near-real names from medieval Eastern Europe or Frankish names. That hasn’t really changed from writing Warhammer and 40K – pick a source and then tweak it a little. I didn’t have to come up with stormbows and lightning hammers and such. Tyler: Your story include some rather important scenes with some of the mortal survivors of the Realms. For me, I have always found regular mortals inclusion a rather moving and humanizing element to the AoS fiction so far. How important do you think it is to include elements like this that help remind the readers what the Stormcast are fighting for? Gav: This has been true of several of the AoS novels. 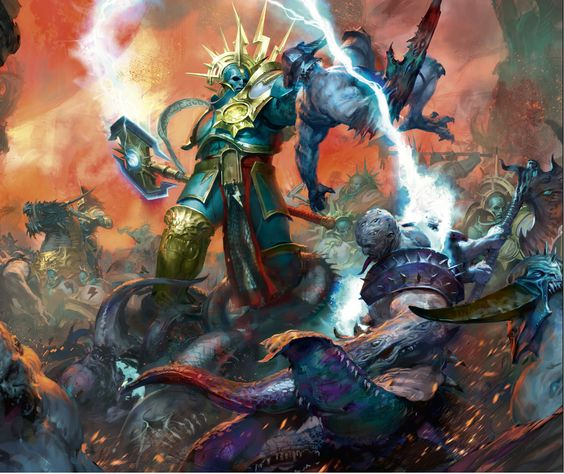 The crusade of the Stormcast is such a big thing, a cosmic battle between forces, it’s hard for people to relate to it on an emotional level. Bringing the conflict down to the human factor, making it real for people that readers can relate to, is essential in getting them to care about the story. The nature of the Stormcast themselves is also a factor. 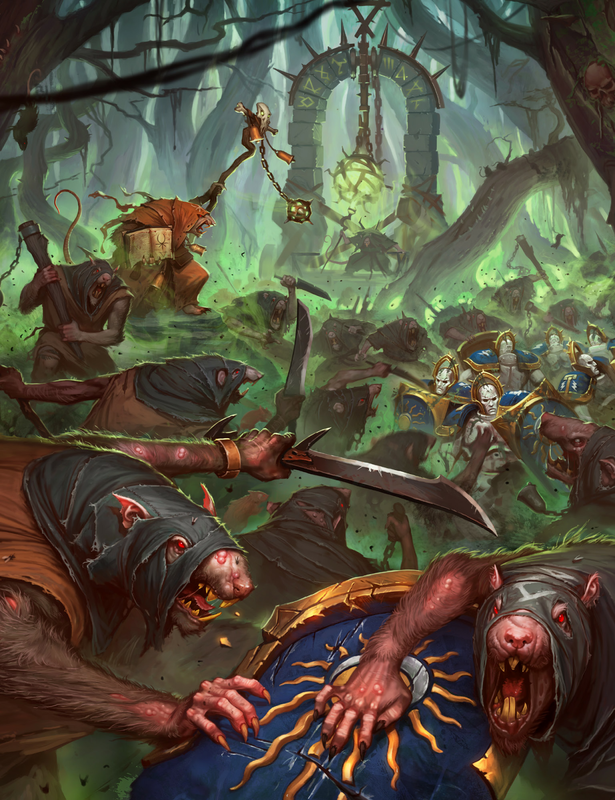 They are just at the beginning of their journey as warriors of Sigmar, so really all we have to play with in story terms is their history – their backstory is more prominent at the moment. But we can end up doing it too much if we’re not careful. As the narrative unfolds I hope the Stormcast develop their own, current stories that are as compelling as their history. In 40K I can write a story about Commander Dante or Jain Zar and it has weight because of who the character is not who they were and what they’ve done before. We need to get the Stormcast into a similar place, but that takes time. Tyler: Who was your favorite character to write in Warbeast? Gav: Probably Theuderic Silverhand, if only because it challenged me to write a character with which I have little natural affinity. It’s easy for us creative type to like the passionate, wild Arkas Warbeast, but getting sympathetic with the methodical, reserved guy was more rewarding. I also liked Dolmetis, the Knight Vexillor of Arkas, because it’s not often you get to create a Stormcast Eternal with a bit of sarcastic wit and hint of rebelliousness. Tyler: The ending to this book was pretty unique due to the fact that our two main heroes actually die, being Stormcast though they don’t stay dead. I found it somewhat horrifying to read about these two experiencing their own deaths only to live through it. Do you think this must take a toll on the Stormcast? We also get to see the effects of the reforging process on them, which I think is a fascinating idea. What are your thoughts on the reforging and the fact that the Stormcast lose a bit of themselves each time? Gav: When I submitted my synopsis I included a note to the effect that I figured every writer had probably done a reforging scene so if the editors wanted to change it that wouldn’t be a problem. I was surprised – nay, shocked! – when Nick Kyme got back to me and said they hadn’t done it yet. It wasn’t so much the reforging itself at the outset, by the idea that the characters might die. They fail! As a character development point you don’t get much stronger than that. I wanted to show that there is a price, that being reforged is not the same as being immortal. It’s part of that characterisation I mentioned earlier, a means by which we can start to understand that the Stormcast aren’t unfeeling automatons, that death does have meaning for them. If they were truly immortal, if death wasn’t an issue, they could not be truly brave because it is overcoming fear that marks out courage, not its absence. Tyler: I really enjoyed how Arkas and Theuderis were opposites to each other, even in how they were picked by Sigmar to join the Stormcast. As far as I know Theuderis is the only Stormcast so far to have been picked by Sigmar while not about to die or in a battle. Can you tell us a bit about how that came about? Gav: Like their personalities, this was pretty hardwired into the story from the outset. It was an ‘odd couples’ narrative, and nothing could have set the two Stormcast Lord-celestants further apart than being ‘ascended’ at the nadir and zenith of their mortal lives. Arka/ Arkas had to have this deep rage within borne out of his frustration, whereas Theuderic/ Theuderis is the leader with hope, who has seen what can be achieved with dedication and cooperation. Tyler: How was writing this book different then writing a book set in the Old World of Warhammer? Gav: Massively different in some ways. Just learning the names, the weapons, the style of story was a challenge at first. I’ve been knocking about with the warhammer world for nearly 30 years, and writing in it for more than 20. As when I started with the Horus Heresy, Age of Sigmar is basically going back to school and starting from scratch, and I must admit I’m not a natural researcher... There was a lot to read and trying to parse the useful parts out of the wealth of material was difficult. Once I had a story I thought was suitably grand for the cosmic nature of the setting, everything else came down to detail. 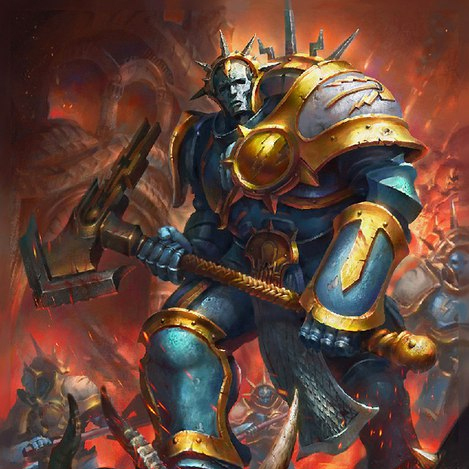 On the flip side, I was also trying hard not to write the Stormcast Eternals as space marines. That wasn’t easy either, because as a writer you have a set of tools to use for superhuman, merciless warriors and I kept reaching for the old ones rather than making new ones... I think the results were worth the effort though. Tyler: You are known for writing about the Elves, do you plan on trying to write one of the books on them once they are fully reintroduced into the AoS setting? Gav: I don’t know what’s in store for the (A)elves so whether it’s something I’d be interested in would depend on the specifics of the characters and story plan. The same is true for the duardin – my previous interests and loyalties don’t necessarily translate into the new setting. Because it’s a fresh start it might be for the best to keep away and allow others to take the story forward, I don’t need to bring my baggage along. Tyler: If you could have picked any of the storylines from the campaign books for AoS so far to write a novel based on, which would it be? Gav: I couldn’t say, the truth is that aside from what I’ve read for Warbeast and the couple of short stories I’ve written, I don’t have the time to keep up with all of the developments. Like politicians, I don’t really ‘do hypotheticals’, I just concentrate on the tales I have coming up, and they’re all HH and 40K at the moment. Tyler: If you could write about anything that is known about AoS so far at all, what would you want to write about? I would definitely be interested in reading a book set in Azyrheim. Gav: That would be an obvious lure – depending on what the developers and writers at GW envisage as going on in Azyr. But as with the other storylines, it’s tempting to go off-road into the areas not being explored but the hard work is laying down the groundwork and developing the ideas that are going to form the spine of the new setting and the recurring characters that readers will want to keep coming back to. I’ve not done much from the Chaos point of view – just the Advent short Lord of the Cosmic Gate – so maybe there could be something there. 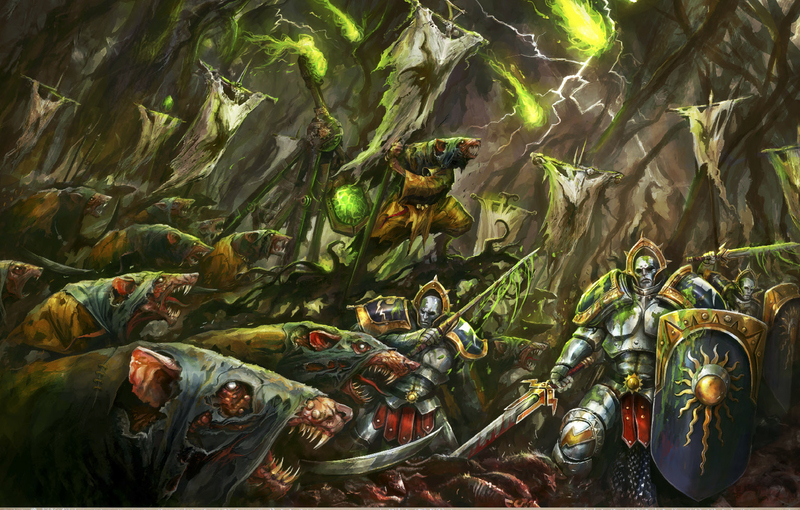 It’d be interesting to revisit ideas from my old, old Slaves to Darkness trilogy but reimagined within the context of Age of Sigmar. Tyler: Do you plan on continuing the stories of any of your characters from Warbeast? Gav: I left them in interesting places should I get the chance to return, but that would be dependent on the plans of BL / GW. Gav: Thanks for having me! A big thank you to Gav Thorpe for taking the time to do this interview for the site. You can stay up to date on what he is doing as well a read a bunch of fascinating stuff, like his author notes for this very novel, on his website here. You can also sign up for his newsletter which will collect all of his recent musings and deliver it right to your inbox. He also has contests from time to time to win one or two of his books, so it's definitely worth checking out!